When you create items on a Toolbox page, some of them might be very similar and be based on the same type of Metaclass. For example, there are many different types of Action element and, in BPMN 2.0, you can create each type of Event element either stand-alone or edge-mounted on another element. Rather than populate a Toolbox page with every variation, you can create a 'base' Toolbox item and offer a choice of variant from a sub-menu, which is displayed when the base item is dragged onto the diagram but is otherwise hidden. This technique is very useful for 'disambiguating' Stereotypes that can be applied to multiple Metaclasses. In the submenu, you define just the variant types (as for the Action element list). However, if the variant also has a ToolboxItemImage defined for it, that icon is displayed against the variant name in the sub-menu (as for the BPMN 2.0 Events). You can also use this method to specifically define icons that will be applied to the submenu options. The name must not match the name of any external stereotype that exists in any other Profile. The sub-menu element can have an alias. In this sub-menu Stereotype element, create the attribute isHidden with an initial value of True. Define additional attributes for the rest of the items in the Toolbox, as normal. 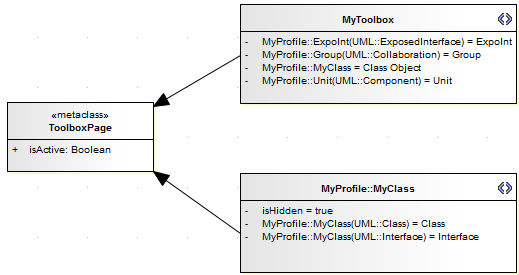 Create <<Extension>> relationships between each Stereotype element and the ToolboxPage Metaclass element, as illustrated. When this Profile is in use, and when the Class Object item is dragged onto a diagram from the Toolbox, the hidden menu displays giving the choice of Class or Interface; on selection, the element is dropped onto the diagram. If no icon has been assigned to the Toolbox item from existing definitions, and you want to display one, define the image as a ToolboxItemImage icon.